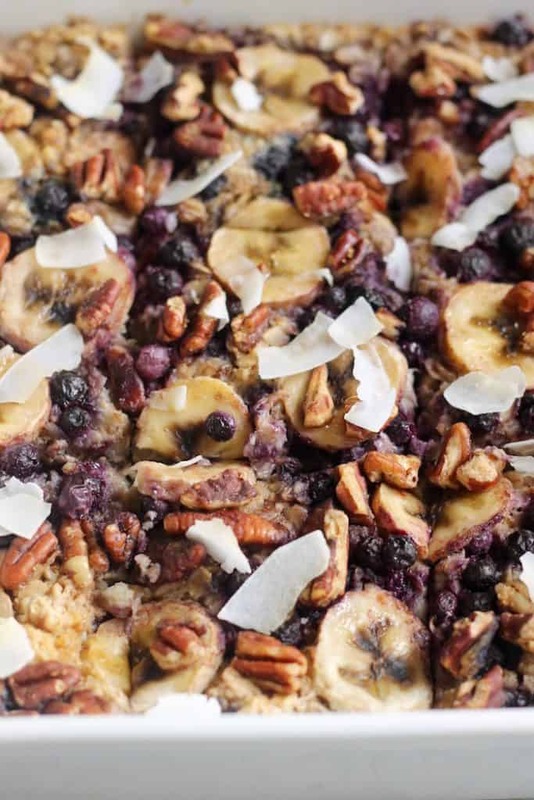 Start your morning with this easy and satisfying Blueberry Banana Nut Baked Oatmeal! 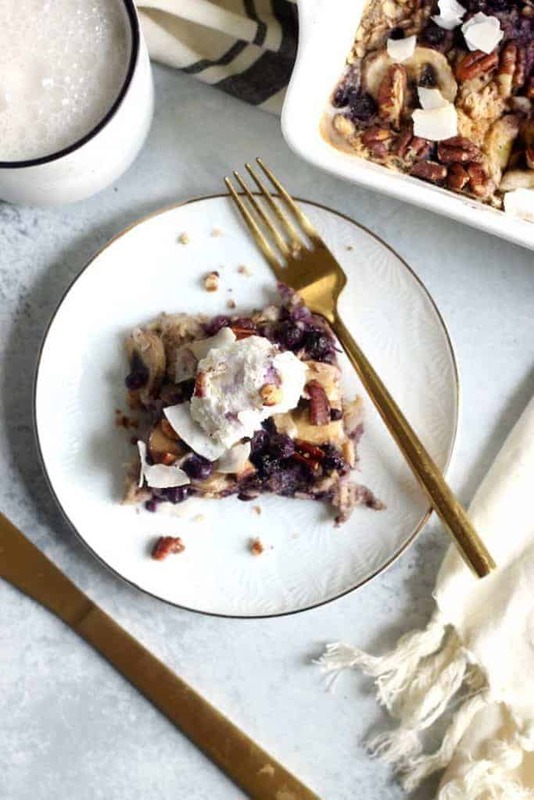 It’s studded with sweet blueberries, sliced banana toasted pecans and a dusting of brown sugar. Vegan and gluten-free! I was thiiiiiiiiiiiis close to calling it “Breakfast Bread Pudding of My Dreams.” Cuz that’s a normal Google search, right? Calling all cozy fall breakfast lovers! Seriously though. Don’t you just love when breakfast collides with dessert in that cosmic way where you JUMP out of bed in the morning because you know you have THE most legit breakdessert downstairs waiting for your face?! Ohhhh the toasty pecan topping. They seriously made the dish! Don’t you skip ’em. This beauteous blueberry dream breakfast recipe comes from Nature’s Path new e-book, Your Guide to a Vegan Diet! Whether you’re seeking a friend in plants to boost your health, impact the environment, protect animals, or simply try something fun and new, incorporating more plant-based foods into your diet is a stellar idea. And it doesn’t have to be all or nothing! Better to focus on saying YES to adding more plant-powered goodies like fruits, veggies, tofu, beans, nuts and seeds rather than focusing on what you’re not eating. Like I always tell my clients, the more plants the merrier. Even if you’re just trying out one meatless meal or day a week, that’s a freaking awesome step in the right direction for your bod and the planet. Everyone is different and everyone has different dietary needs. Major respect to anyone and everyone that recognizes that for themselves and others! What works for me may not work for you and vice versa. What I do know is that eating more plant foods can make a world of a difference when it comes to boosting your health and that of the environment. The most memorable fact I learned while researching for my graduate thesis on cancer survivors harvesting at an urban garden was that one in three cases of cancer stems from nutrition. Crazy, right?! I find those powerful little phytochemicals in plants so freaking fascinating. The power they have in preventing and reversing chronic disease is the reason I became so passionate about this topic in the first place. If you’re interested in learning more about the ins and outs of the plant-based world, you MUST check out Your Guide to a Vegan Diet. It’s packed with solid information on plant-based protein, how to prevent vitamin deficiencies, dairy substitutions, egg substitutes in recipes, advice about plant-based eating, easy printable recipes like this one, and more. And if you just want to go to town on the best damn baked oatmeal of your life, that’s totes cool, too. 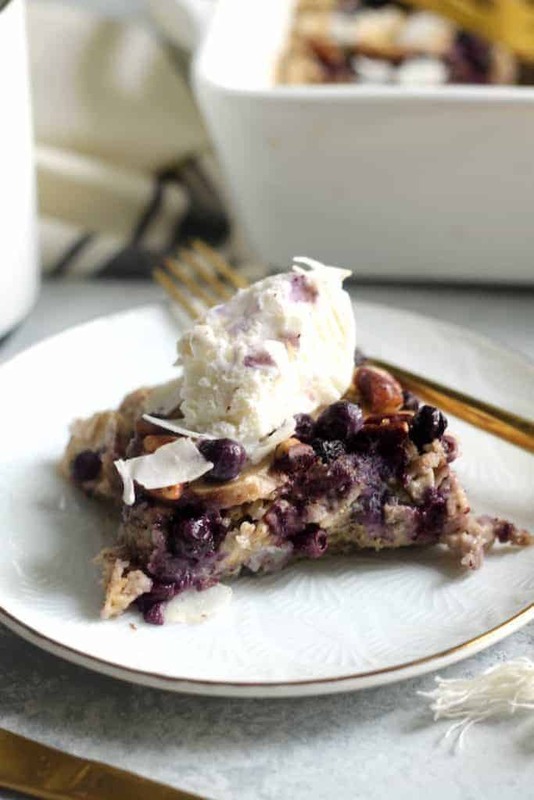 Start your morning with this EASY, sweet, and satisfying Blueberry Banana Nut Baked Oatmeal! 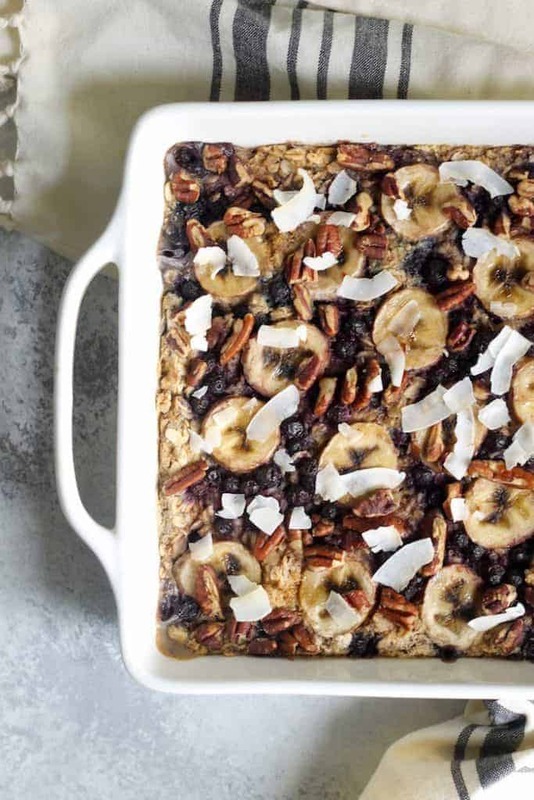 It’s studded with sweet blueberries, sliced banana, toasted pecans and a dusting of brown sugar. Vegan and gluten-free! In a 9” x 9” baking dish, combine oats, ground flax seed, baking powder, salt, and cinnamon. (I added a pinch of cinnamon, too!) Mix well. In a medium bowl, combine soy milk, oil, vanilla, and maple syrup. Mix well and slowly pour over dry ingredients, stirring any areas that aren’t well covered. Top with frozen blueberries, sliced banana (pushing them into the oatmeal slightly), and pecan halves. Sprinkle everything (focusing on banana slices) with brown sugar. Bake for 30 minutes (immediately after assembly.) Cool for 10 minutes before slicing and serving. Store leftovers in an air-tight container in the refrigerator or freeze slices in parchment paper and reheat before eating. This post is sponsored by Nature’s Path. Thanks for supporting the brands that support Hummusapien! My friend and I are totally going to attempt to make this. She’s a new vegetarian and is big on exploring new recipes! Love the idea of mixing these two flavors together! I usually stick to just banana muffins or blueberry bars…this is sure to be a huge hit in my house! I can practically smell this through my phone! Such a great dish for thanksgiving morning! We have everything needed to make this, so it’ll for sure happen this Saturday!! I printed the recipe, and I cannot wait to make it! There’s nothing better than realizing you already have the ingredients!! Love love this! Came together quick and easy. I had it for dinner because I honestly couldn’t wait till the morning! This looks so delicious, I now absolutely must make it this week. No questions asked. Do you think if I wrapped portions in parchment paper and frozen them, they would keep well for reheating? Yep! Cozy breakfast on the go! what is the white blob on top? It’s So Delicious vanilla coconut milk ice cream! Super yummy!! But how should I store this? In the fridge? Cool! 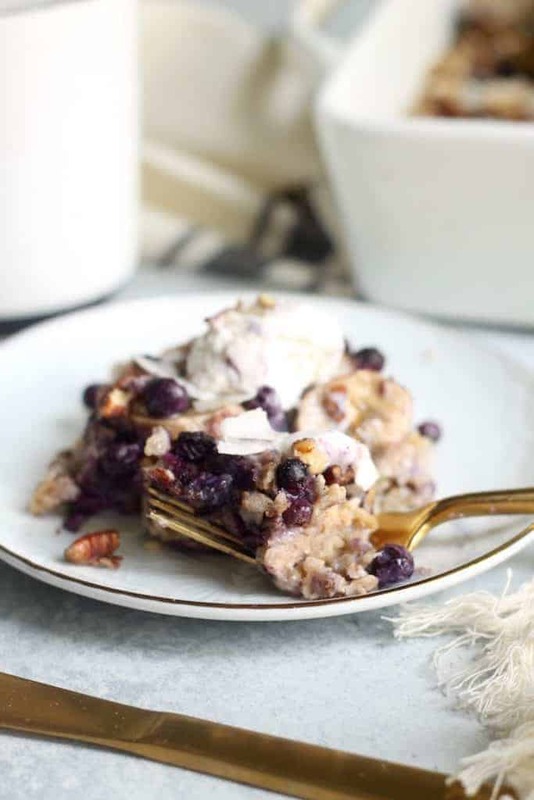 I love this easy and satisfying Blueberry Banana Nut Baked Oatmeal!!! 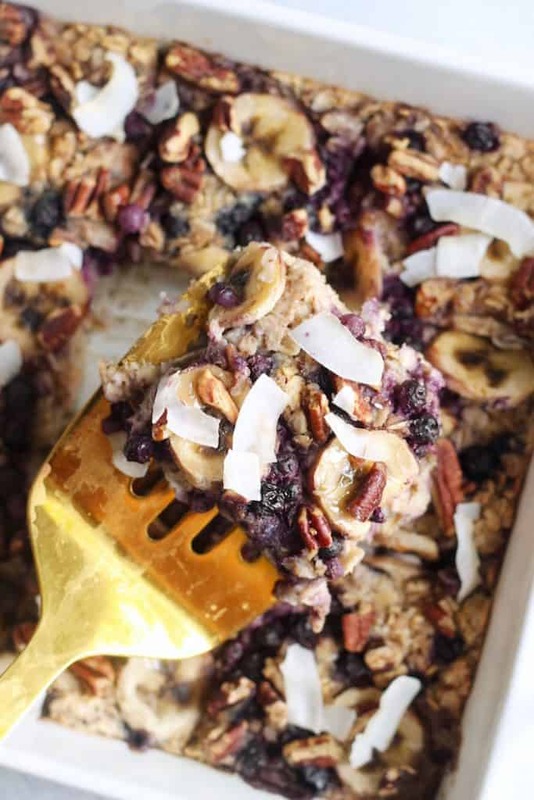 Easy and healthy Blueberry Banana Nut Baked Oatmeal.i will try it for sure. Is it ok if you don’t reheat it?? I would like to take this for a camping trip.